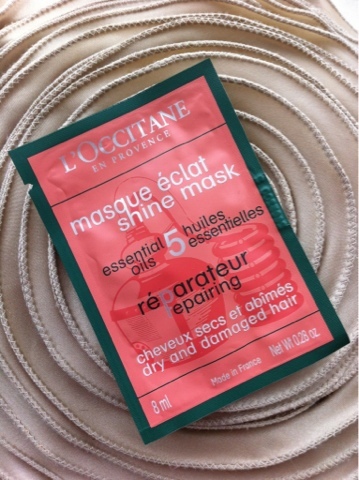 I've been meaning to blog about the L'OCCITANE Repairing Mask for for damaged hair. Seriously this smells divine, I wish I could bottle up the scent and make it into a body cream or a body wash! It's so good, because I have long hair I used the whole sachet and literally squeezed every last drop out of it. Essential oils are used to help nourish the hair whilst also protecting the hair from the environment. The shine Mask is also great for coloured and chemically treated hair, which is great for mine as I dye mine myself. I loved how my hair smelt amazing even after the mask was rinsed away. Plus once my hair was dry I could still smell the beautiful aroma of essential oils. Free from parabens, SLES, synthetic colorants, formol or formaldehyde, animal ingredients, triclosan and BHA. You can buy the full sized 250ml mask online from the L'Occitane web site here.